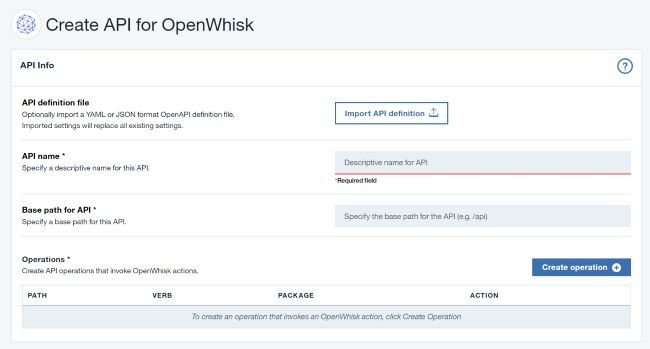 I’ve shared more than a few examples of OpenWhisk APIs that I’ve shared with API management but I haven’t actually detailed what that process is like. Today I’m going to review what exactly it is, how you enable it, and how you make use of it. As with most things I say here about OpenWhisk, remember that this is still fairly new and some of the details will probably change in the future. Robust statistics involving everything from how often your API is run to what arguments are passed to what status it returned. I’d also add memory usage, throughput, and pretty much every single aspect of every single invocation of the API. I want to be able to see how well my API is performing over time and judge where I need to spend time optimizing, or perhaps what new features I need to add. For example, if I see people using a cat API to search for female cats of a certain breed, I may want to add simpler ways to get that data. 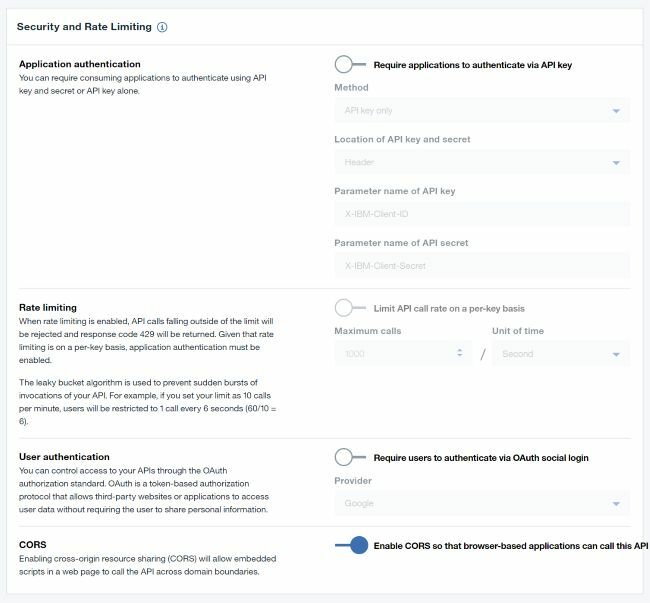 Security and usage settings that let me lock down my APIs to require a key, or other login, and set usage limits. This ties back to the stats area as well as I’d like to be able to see who my biggest consumers are and how they make use of my API. While the first two points are the main things I care about, I’d also add support for, in some way, documentation. That could be automatic documentation and testing tools like what LoopBack provides. In the best of worlds, my API management generates docs or publishes docs I’ve already written, but always allow me to customize and add to what is provided out of the box. 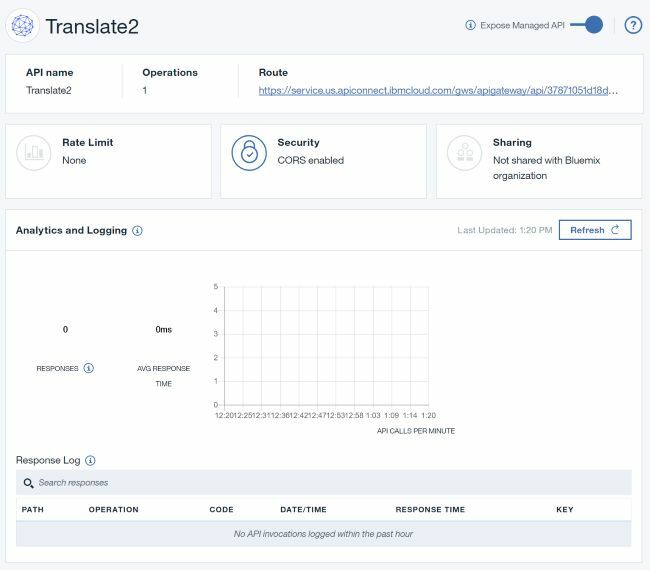 So obviously IBM has some experience with this - and you can see this in full effect with IBM API Connect. 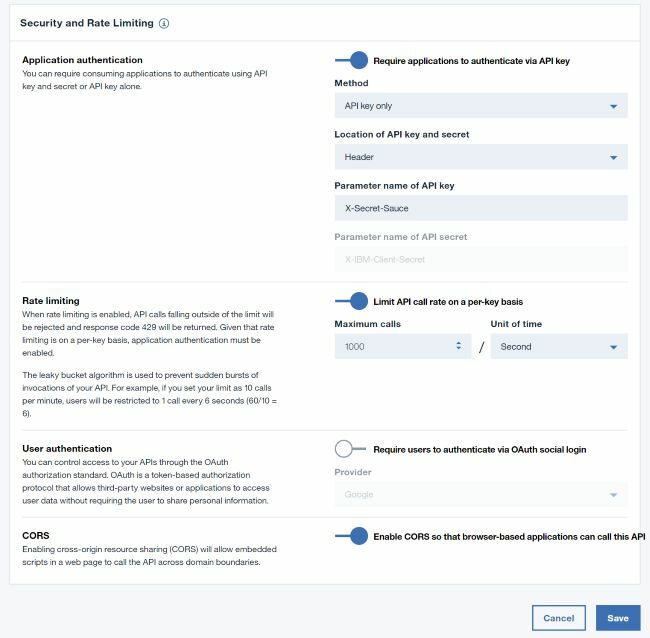 While you can definitely make use of API Connect with OpenWhisk, there’s a new built-in option to for folks using OpenWhisk under Bluemix called “Bluemix Native API Management.” To keep it simple, I’ll refer to this as BNAME. Via a secured REST API - this is automatic and is what the CLI uses to work with your actions. Via Web Actions. This allows for anonymous access only and doesn’t provide any built in tracking. 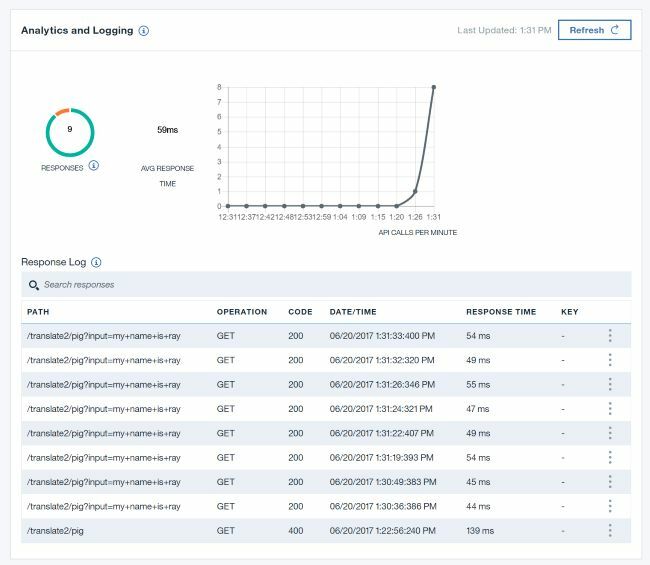 Although you can write your own security layer and get analytics by looking at your activation history and using the monitor UI. 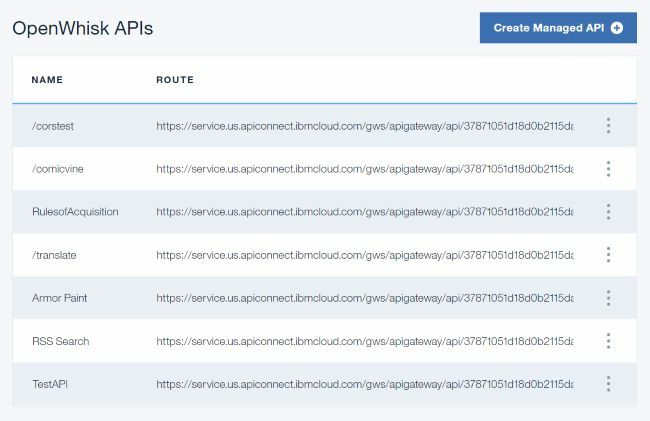 And finally, via the API Gateway. 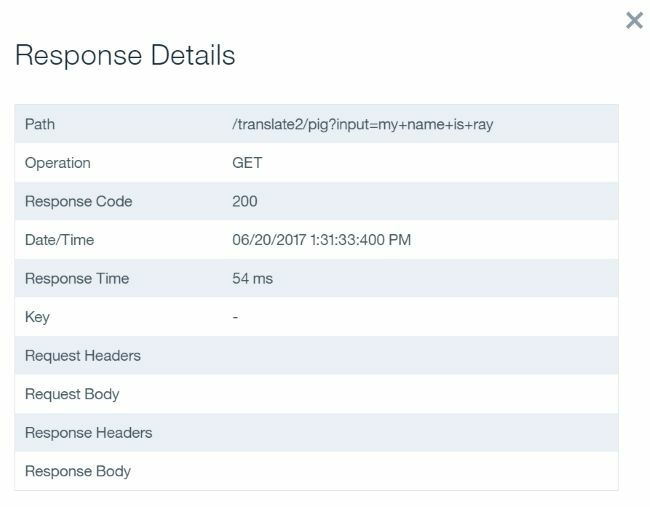 The gateway feature is how we can manage our OpenWhisk APIs and do some of the stuff I described above. You can work with the gateway via the CLI or the UI and in the rest of the post I’m going to walk you through the process of doing that. piggish = piggish + word.substring(1) + firstLetter + "ay "
piggish = piggish + word + " "
Woot. Nice and simple and totally a real world example. Totally. Alright, let’s break this down. BASE_PATH is like a group for your API. Imagine you have a few APIs related to cats: get, delete, create, search. I’d want all four of them to be grouped under a BASE_PATH of cats. That means my APIs will end up looking like this: (stuff)/cats/get, (stuff)/cats/delete, and so on. Also, this “group” is where you will apply security and rate limiting. All four will be rate limited/locked down or not - you can’t set unique values for each end point. For all intents and purposes, our API is “cats” and those individual end points are simply parts of the great API. API_PATH is just the end point, as described above. So “get”, “delete”, etc. The VERB will be one of the “regular” verbs used with REST APIs: get, put, post, etc. You “should” follow convention here and use GET for read actions, post or put for create/update, but the REST Police will not be stopping by your cubicle to slap you on the hand if you don’t follow the norm. Finally, the ACTION is just the action you want to expose. Now let’s turn our attention to the UI. 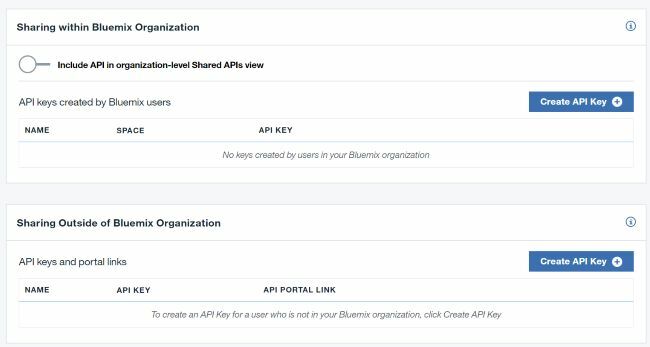 After logging into Bluemix, going to your OpenWhisk portal, you can then select APIs to see what you have being managed by the system. Notice how the API I created via the CLI doesn’t have a nice name. You can actually fix that by using the -n flag when creating the API. You can also fix this in the UI by editing the API. Instead of doing that, though, I’m simply going to create a new one so you can see what that process is like. I’ll begin by clicking that nice, obvious “Create Managed API” button. A note on that “Action” drop down. This will only show 30 of your actions sorted by the last time they were updated. I’ve filed a bug report for this already. If you do not see your action, just update it via the CLI and it will “bump up” to the top of the list. 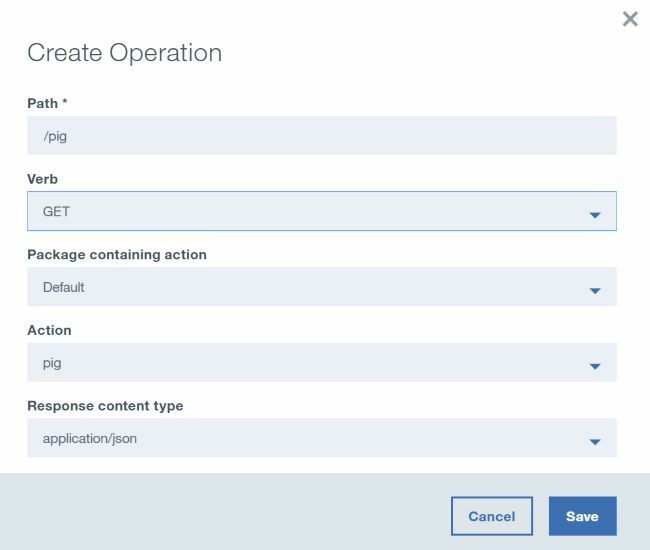 Another bug to watch out for - if you are editing an operation for an API created by the CLI, the selected action will not default to the one you chose! Note! You are not done yet. Scroll to the bottom of the page (again, I’m ignoring the security/rate limiting thing for now) and click “Save & Expose” to finish. 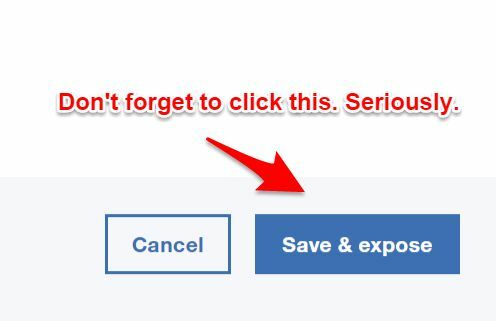 It is absolutely crucial you pay attention here - because the modal auto dismisses. If there is an error, it will show up - and then disappear. I’ve filed a bug report on that as well. I tend to be scatterbrained and on more than one occasion I missed something because I didn’t expect an important message to just disappear. I filed a bug report to make this a bit more obvious. If you can’t tell, I tend to miss the obvious most of the time. Finally, note that there are no date controls for any of the logging. This is the biggest missing piece in the manager for now. There’s no way for me to get a deeper look of my history or to even see if my client’s complaints about performance issues yesterday were actually valid. That being said, it is a good start and I’m hoping to see some improvements here soon. Alright, let’s lock this puppy down! The first thing you’ll do is simply require authentication. That’s one toggle - just turn it on. As soon as you do, you’ll have a few options. 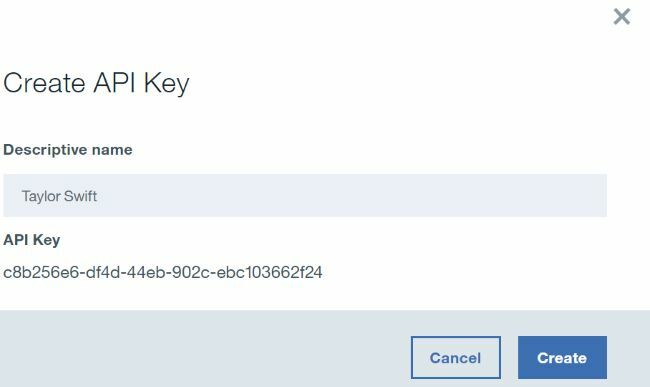 For method, you can select between requiring just a key or a key and secret. Finally, you can tweak the name of the header if you want. For example, if you set your limit as 10 calls per minute, users will be restricted to 1 call every 6 seconds (60/10 = 6). Next, you can integrate social OAuth login for the API, with either Google, Facebook, or GitHub, but I’ve yet to test this. I’m assuming you pass a bearer token with the API call…. but I’m not sure. I wasn’t able to find docs for this and I plan on playing with it next week. Finally, note you can enable/disable CORS. It’s on by default. Now if you try to run the API, you’ll get a 401 error, which is what you want. To start sharing this, go into the “Sharing” menu. My API only has one method, but in a proper API, this tool would be awesome as it would give me a one stop place to see everything supported. On the right hand side you can see a sample curl command I can use to test. You can even try the operation in the UI itself, but unfortunately, there is no UI to supply the required argument. 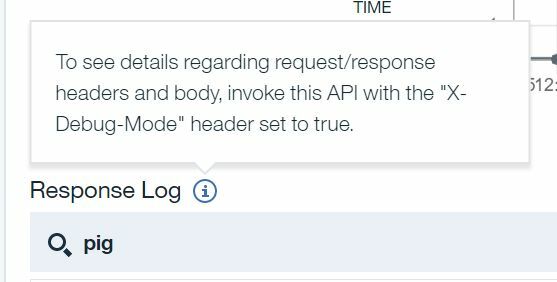 OpenWhisk does support defining, at a meta level, what parameters your action needs (see the docs for an example), but this doesn’t seem to pass over to the API Explorer. Whew, that was a lot, and I hope it was helpful. As I think you can see, this is pretty powerful, and while the UI has some room for improvement, I think it’s pretty cool what you get out of the box. If anyone is using this yet in production, I’d love to hear what you think (and would gladly pass back any suggestions). Let me know in the comments below!